The past few years have seen more than the usual amount of political upheaval. But, interestingly, most regime changes have resulted in pretty much the same thing: Higher government spending and bigger deficits. Apparently the only “reforms” today’s voters will accept – which is to say the only actions that don’t get a leader kicked out of office – involve spending rather than saving money. Republicans – the party of smaller government – gained control of the White House and Congress in 2016, and proceeded to take a meat ax to bloated entitlements, lowering the government’s share of the economy to levels not seen since the Reagan years. (MarketWatch) – The Treasury Department says that adjusted for timing-related transactions, the deficit would have been $270 billion over the last two months compared to $250 billion during the same period the prior year, with tax revenue up by 1% but spending up by 4%. The budget picture is deteriorating as the U.S. taxes individuals and companies less and spends more, mostly on defense and benefit payments to an aging population. Though a growing economy is softening the blow, it’s possible that the annual deficit will top $1 trillion this year. (Bloomberg) – Italy’s populist government has pledged to the European Commission that it will lower its deficit target to 2 percent of national income next year. For a cabinet that vowed to defy the “bureaucrats” in Brussels, this is a stunning climb-down. But unless Rome is ready to row back on some of the key pledges included in its 2019 budget, it will amount to little more than cosmetic change. So when prime minister Giuseppe Conte told reporters on Monday that Italy would now target a 2.04 percent deficit, this was indeed a remarkable U-turn. The markets shouldn’t celebrate too soon, though. For a start, Di Maio and Salvini have yet to utter a word about what Conte has said. In most other countries, a prime minister doesn’t have to wait for his two deputies to confirm that his words have value. But in the strange coalition arrangement that rules Rome, this is certainly the case. Moreover, details matter. In a sense, the 2.4 percent deficit target for next year wasn’t the main problem with Italy’s budget. Worse is the wildly optimistic growth target, which means that borrowing will probably be much higher than predicted. Then you have the non-credible budget deficit targets for the following two years, which rely on VAT increases that no one believes in. Finally, there’s the decision to keep the structural deficit unchanged between 2019 and 2021, instead of aiming to reach a balanced budget over the medium run. For a country whose public debt stands at more than 130 percent of GDP, these are hardly details. New president Emmanuel Macron tried to modernize the laughably hidebound French labor markets. But it blew up in his face, as tens of thousands of protestors took to the Paris streets in a conflagration that generated global headlines and raised questions about Marcon’s political future. (Telegraph) – Emmanuel Macron’s bid to buy off France’s “gilets jaunes” protesters with instant budget handouts threatens to blast through eurozone’s fiscal limits, fatally damaging his credibility as the champion of the European project and the guardian of French public accounts. He had pledged root-and-branch reform of the French economy and a restoration of spending discipline after 11 years in breach of the EU’s Stability Pact. The calculation was that Berlin would in return drop its long-standing opposition to fiscal union and shared liabilities, agreeing to rebuild the euro on stronger foundations. To the extent that this bargain was ever more than wishful thinking, it is dead now. The German Kanzleramt and finance ministry have watched near insurrection sweep the major cities of France over the last four weeks – with “Act V” already announced for next weekend – and watched a belated riposte from Élysée Palace that amounts to a climbdown. “Macron’s response suggests that a rioting and pillaging mob can dictate politics, while those who demonstrate peacefully – or not at all – are ignored,” said Clemens Fuest, president of Germany’s IFO Institute. “His whole ability to push has been called into question. What he has announced are just tax giveaways. 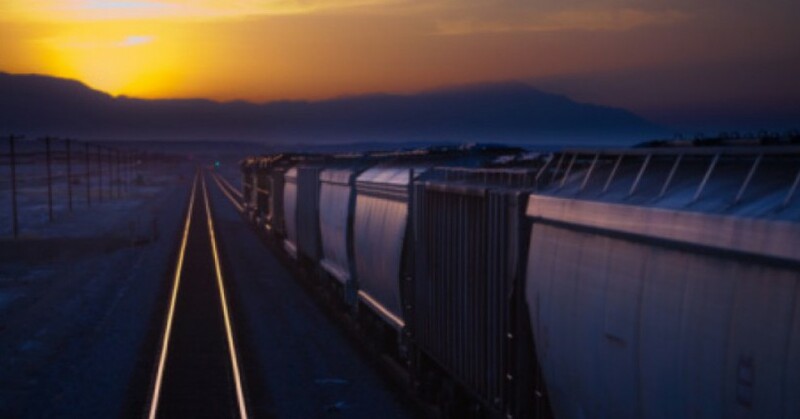 “It is quite obvious that the budget deficit will be at least 3.5pc of GDP next year, and probably 4pc because the economy is heading for a light recession,” said Professor Jacques Sapir from the École des Hautes Études en Sciences Sociales in Paris. 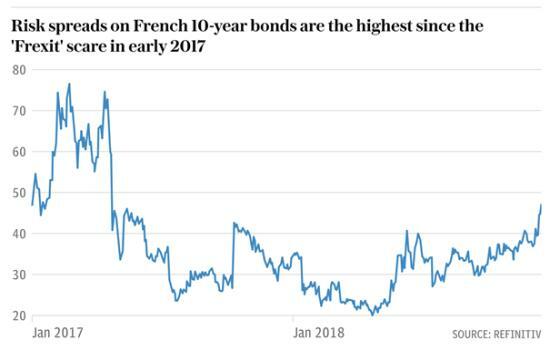 Risk spreads on French 10-year debt jumped to 48 basis points on Tuesday as bond vigilantes began to digest the scale of fiscal slippage. This is the highest level since the ‘Frexit’ scare before the French elections in early 2017, when the Front National’s Marine Le Pen was riding high in the polls. Kallum Pickering, from Berenberg Bank, said Mr Macron has “turned from darling to fallen angel very quickly”. The cancellation of the fuel tax rise and latest sweeteners will together cost €14bn. “France’s debt-to-GDP will likely rise beyond 100pc as a result,” he said. The [EU] Commission is in an awkward spot. The decision by Emmanuel Macron, France’s president, to pass a string of tax cuts and spending increases to appease the “Yellow Vest” protesters has made it politically harder to move against Italy without smacking of hypocrisy. But if Brussels were to accept a few cosmetic changes from Rome without any real substance, its already shaky reputation as the enforcer of the bloc’s fiscal rules would be in tatters. So the poker game between Brussels and Rome goes on. It’s just that both players have far fewer chips than they originally assumed. Keep in mind that all this is happening in an expansion. During the next recession, expect government spending and deficits around the world to soar to stunning levels, raising questions about the viability of not just presidents and prime ministers, but of currencies. This entry was posted in banking, Capitalism, Collapse, Currencies, Debt, Economics, Economy, Governments, Insurrection, Money, Pensions, Politics, Taxes and tagged France, Italy, Macron, Revolutions, US budget deficit. Bookmark the permalink.